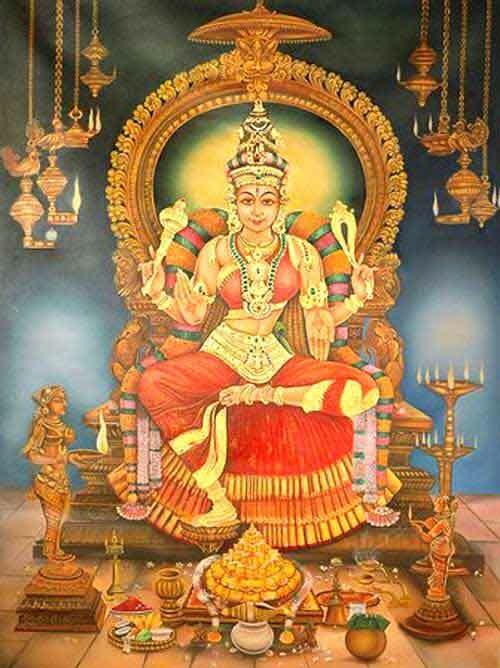 Meenakshi was the princess of the ancient Tamil kingdom of Madurai. Story of Madurai Meenakshi and Shiva as Sundareswara is found in many puranas and folklore. As per Thiruvilayadal Puranam, a Pandya King who was the ruler of Madurai performed and great yajna to get an heir to this throne. Instead of an infant, the ruler was blessed with a three-year old girl who had three breasts. A perplexed king then heard a voice from the heaven proclaiming that this is his heir and that he should raise her like a son. The voice also told that her third breast would fall off the day she comes to face to face with the man she would marry. Meenakshi grows up to be a powerful warrior and ascends the throne, leading a great army of women and defeats all the kings of the world. After defeating the kings of earth, she defeated the rulers of the underworld and then she defeated Indra, the king of Devas, and many others. She finally comes to Mount Kailash in search of a famed hermit who was very powerful and refused to bow before anyone. No king or army was able to vanquish him. Meenakshi was determined to defeat the famed hermit. She believed she had met her equal in battle in the snow capped mountains of Kailash. She charged ahead of the rest of the army and suddenly she was blocked by a handsome hermit. She ordered the young handsome man to move out of her way. He merely smiled and stood his ground. Meenakshi, the warrior princess, considered this as an insult. She jumped of her horse and charged towards the young man with an upraised sword. The man, who was as calm as the Himalayas, remained unperturbed and kept smiling at the furious princess. Meenakshi came near the young man and raised her beautiful but ferocious eyes to glare at the arrogant young man. Meenakshi was startled. She became immobile and her third breast dropped of its own accord. She felt inert and as if she was melting in the penetrating gaze of the young man. Her upraised arms came down. She dropped her sword. She bent low to touch the feet of the handsome hermit who was none other Shiva as Sundareswarar, the beautiful Lord. Meenakshi was Goddess Parvati, who had taken the form of Meenakshi to play the divine leela. Soon, the wedding of Sundareswara and Meenakshi was held and it was presided by Vishnu.